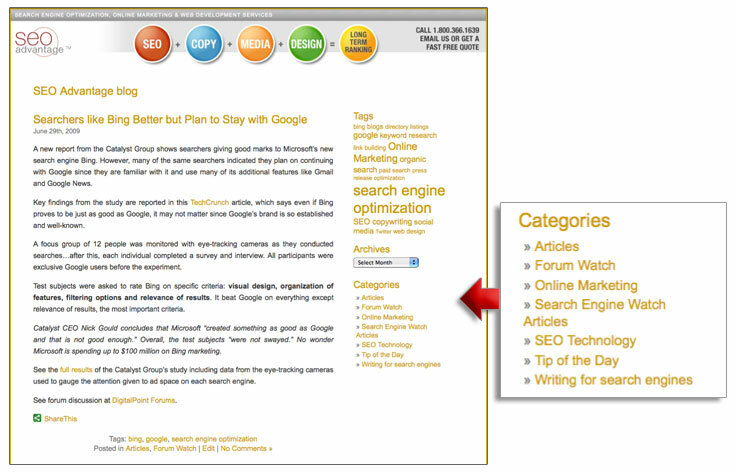 Categories and tags are common features in today’s blogging software programs. Not only do they organize posts for easy search and reference, they are helpful in optimizing your blog for the search engines. Both of these tools are different in their use and benefit. Knowing these differences and how categories and tags are most useful will help you structure your blog for easy browsing by users and indexing by search engines and blog directories. Continue reading and find out more about what categories and tags are, what each does, their differences and some advice on how to use both for maximum blog exposure and ease of use. Also see an example of how to enter categories and tags using the popular blog software WordPress. Categories are basically broad themes of your blog and a way to give posts a permanent home. Think of them as a filing system, storing posts in the particular drawer each one belongs in. Readers will browse your blog’s categories to get an idea of what it’s about and whether it would be useful for them. Titles of categories should include keywords and be incorporated into the URL for even more SEO benefits. Take our search engine optimization e-blog for example. Online marketing is a big category and a strong keyword phrase as well. And including this phrase in the URL, http://www.seo-e.com/category/online-marketing, enhances site architecture and makes it easier for search engine spiders to crawl the blog’s contents. Not only are categories a way of organizing your posts, they are an integral part of your site’s architecture and navigation. They must be appropriately displayed – generally as a sidebar navigation that’s included on each page of the blog. No matter how or from where someone arrives on your blog, they will be able to easily determine what it’s about. And, blog categories with keywords will further optimize your blog for the search engines. Tags are like those colored tabs you may use to mark different sections of a book…they are keywords that categorize information in your blog. They differ from categories in that tags do not organize information in a hierarchical manner and there are generally more tags than categories. 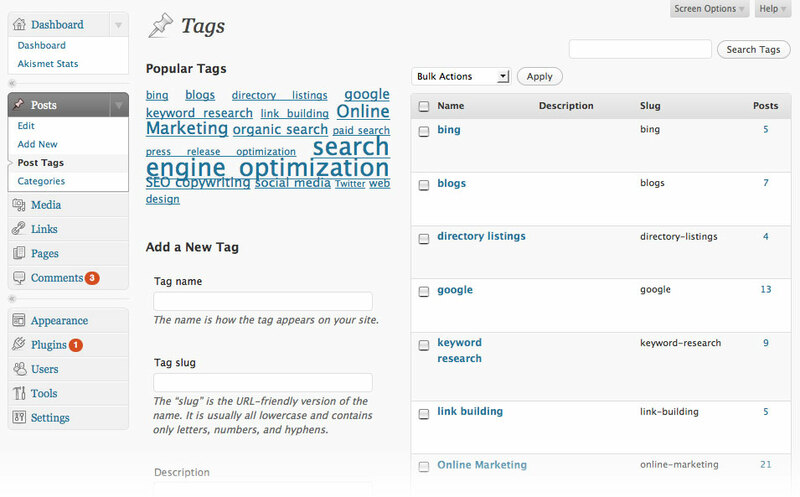 Two types of tags include: external tags and internal tags. External tags were the first type of tags to emerge, becoming popular in conjunction with the development of social networking and Web 2.0 applications. They allow you to share content on niche social networks like Technorati or Del.icio.us. A particular tag on Technorati collects blog posts on that topic from different sites into one place for easy reference. Think of these types of tags as a type of online yellow pages. 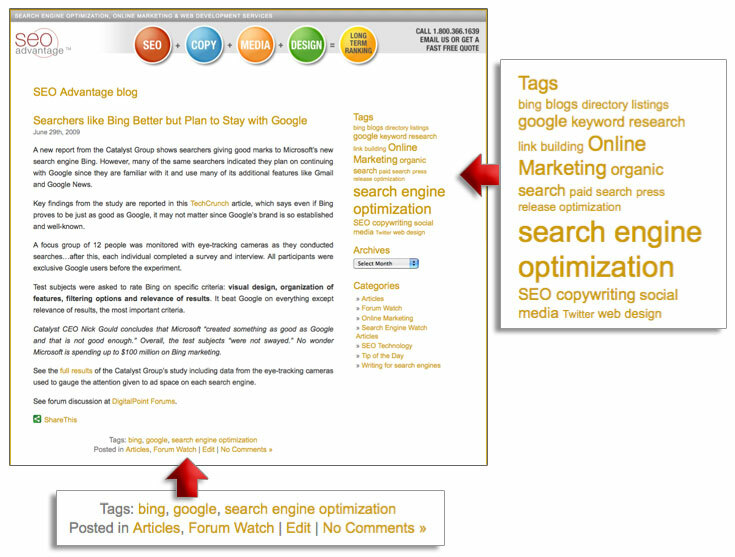 Internal tags are essentially the same thing except they exist on your blog only. These tags are like sub-categories or chapters – they complement your categories by further breaking down posts into similar groups. Tags can be displayed in any number of places on your blog – they can be linked at the bottom of each post or in the sidebar navigation. Unlike categories, tags are not part of a site’s navigational structure so they do not need to be displayed in a sidebar but many blogs do include them there for easy reference. If you plan to display tags in the sidebar navigation areas, use a tag cloud for easy scanning and referencing. Tag clouds are a visual depiction of tags, often showing the most commonly used tags larger and lesser used tags smaller. Users can use them like a topical search of your blog’s contents and also see at a glance which topics you’re covering most frequently. A note about assigning tags: be sure to choose one representative tag for a topic rather than assigning different but similar tags each time you write on that topic. You’ll avoid confusion and clutter by choosing one and sticking with it. For example, all our posts about writing search engine friendly copy might be tagged with “seo copywriting” rather than using other words that could also apply such as “seo copy writing” and “seo copy”. This just means that all posts on the topic will be easily accessed through the one tag, rather than having to click several similar tags. A blog post can be assigned multiple tags, depending on what you’ve addressed in the post. If a post is about how Google assesses copy on a web site, for example, we might give that post the tags “seo copywriting”, “Google”, and “SEO”, ensuring that all the topics addressed in that post are represented by its tags. WordPress allows you to easily add as many categories and tags as you see fit. Each time you add a new post, WordPress uses Ping-o-matic to ping different feeds, tags, directories and search engines. 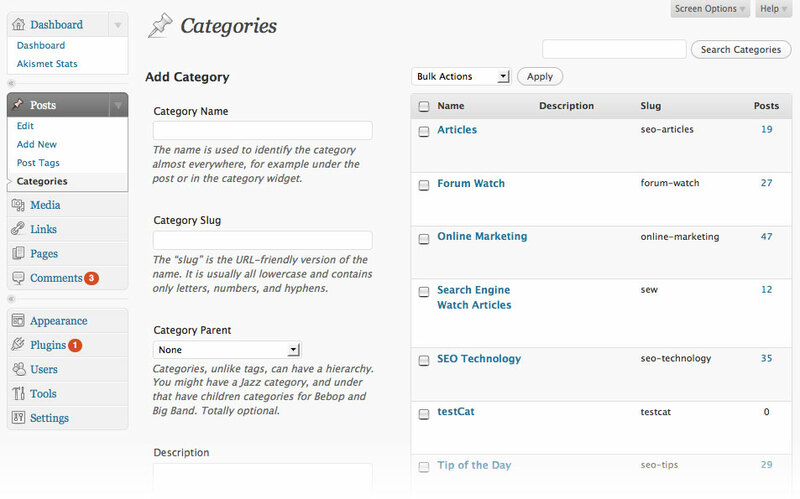 The WordPress dashboard is where you can add categories and tags. It is the first page you see after logging into your blog. On the left navigation you can see links for both categories and tags. Categories can only be edited through that link but tags can be added there or each time you post an entry. Contact SEO Advantage® today and learn more about how we help you set up and optimize your blog as an effective way to build your brand and online presence through greater search engine visibility.